I don’t recall Back To School being equated with Halloween, but all this week, all I’ve been hearing about is how kids are going back to school and what Halloween costumes they should wear. Therefore, director Michael Dougherty‘s new promo for the Trick ‘r Treat Halloween marathon at FEARnet is quite appropriate. In the new promo, Sam, the movie’s little terror in a burlap sack mask, is also heading back to school, though his schoolmates might want to watch what they do around him. Watch the new promo video here below, which really is so adorable… in a creepy way. 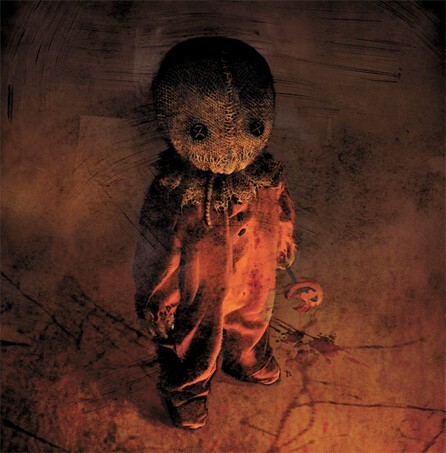 If you’ve never seen Trick ‘r Treat, you should definitely check it out, as it’s one of the best Halloween-themed movies to come along in years. In my opinion, it’s the perfect Halloween film and lends itself to repeat viewings. And Sam? I think he deserves a spot in the Greatest Horror Icons pantheon. Trick ‘r Treat is four interwoven stories that take place on Halloween with such characters as a staid high school principal who is a Halloween serial killer, a college-age virgin seeking that special guy, a woman who hates dressing up for Halloween and whose husband is obsession with the holiday and a group of young teens who pull a cruel prank. Gerard Butler and Lena Heady Back For ‘300’ Sequel?